Imagine walking outside your front door to a war zone every day — without a bullet-proof vest. That’s exactly the kind of risk you’re taking when you get into a vehicle without buckling your seat belt. If you want to protect yourself from the serious injury or death that could result from a car crash in Boston or elsewhere in Massachusetts, make sure you wear your seat belt – every time, no exceptions. Our Boston car accident attorneys understand the accident may not be your fault. And you are entitled to bring a claim regardless of whether you are wearing a seat belt. But belting up is your first line of defense. We’re touching on this issues because, No. 1, we see far too many lives lost senselessly on our roadways, and No. 2, because the National Highway Traffic Safety Administration offers additional information about seat belt safety in the U.S. 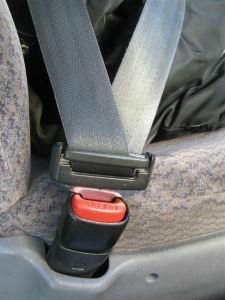 The first is that buckling up is the best way to protect yourself in a crash. Seat belts have saved more than 75,000 lives from 2004 to 2008. To put that in perspective, picture a jam-packed, large sports arena. Wearing a seat belt keeps you inside your vehicle in the event of a crash. If you are ejected from the car, your chances of dying skyrocket. Secondly, air bags alone aren’t enough to save you because they’re designed to work with the seat belts, not be used in place of them. If you don’t buckle up, the force of being thrown toward the airbag when it’s deploying could kill you. Thirdly, when you do buckle up, make sure it fits you correctly. Every person is different, but the shoulder belt should come across the middle of your chest and away form your neck. The lap belt should go across your hips, just below your stomach. Never put the shoulder belt behind your back or under your arm, as this could lead to serious injury in the event of a crash. The Law Offices of Jeffrey S. Glassman LLC is an experienced and dedicated team of car accident and personal injury lawyers. We offer free consultations to injured victims and victims’ families who have been involved in Massachusetts traffic accidents. Call 1-877-617-5333 for a free and confidential appointment to speak to someone about your claim today.